For more than 14 years, ASP .NET has held its place as one of the best web development technologies and many developers see this as the best offering from Microsoft. ASP.Net evolves to bring in better features and functionality, which helps businesses scale better. Each year developers see few new trends that enhances development, and shortens the time-to-market the solution. 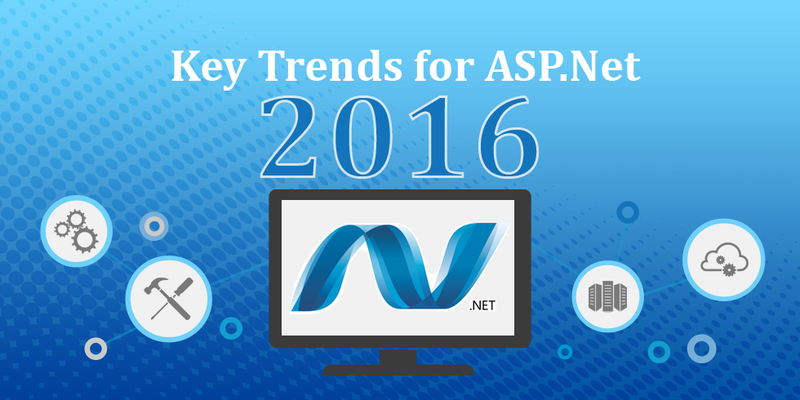 Here, we will discuss a few trends that will benefit both developers and businesses indulging in ASP.Net in 2016. Microsoft surprised many with the announcement of ASP.NET Core 1.0 which isn’t a continuation of ASP.NET 4.6 but a whole new framework. Yes it borrows many elements of ASP .NET as we have known over the years, but has been turned smaller and more modular. This change can be attributed to the need for portability, which would eventually take development to a whole new level. One of the major improvements with .NET core is the fact that it will support more languages, thus making things easy for the developers. There has been a muted response for mobile development using ASP .NET. Decline in Windows based smartphones and tablets have reduced the enthusiasm for mobile development among the developers. But, this is soon to be a thing of the past. New improvements in the framework will see more of mobile development using ASP.Net in the coming years. This technology will be used to develop apps for Android as well as iOS platforms to a great extent. In the last few years talks about Internet of Things and Big Data have gained momentum. Organizations are already looking large volumes of data to gain insights to make informed decisions in real-time. In 2016, we will see more development using ASP.Net, as this platform helps businesses capitalize on the Big Data and Internet of Things technology. You can work on highly scalable and flexible IoT and Big Data based solutions for your business by combining ASP.Net with IIS server. This will help further your business, and meet the desired goals. The Cloud services have become popular over the past few years, and it’s only a matter of time before businesses to move all their data and applications to the cloud. Microsoft has been strongly marketing its Azure Cloud Services and this year we can expect to see a major shift this segment. .Net applications are developed and implemented on the cloud. It is now possible to create multi-tier .NET applications, which have an ASP.NET MVC front-end, and deploy it on the cloud. These applications would use Azure SQL Database, the Azure Blob service and Azure Queue service. With the new release and the demand for better UX especially on mobile, DOT NET development would lead the way to a new era, thus allowing businesses to interact and monetize interaction with their audience. If you are looking to get the best out of your .NET development, we at Semaphore Software have the skills and expertise to meet your aspirations. Write to us at info@semaphore-software.com to know more.